Each of these 7 teachings must be used with the rest; you cannot have wisdom without love, respect, bravery, honesty, humility, and truth…to leave one out is to embrace the opposite of what that teaching is. In this painting you see the Turtle, which represents the teaching of Truth. The Turtle is symbolic of truth because he was here during the creation of Mother Earth, and carries the teachings of life on his back. 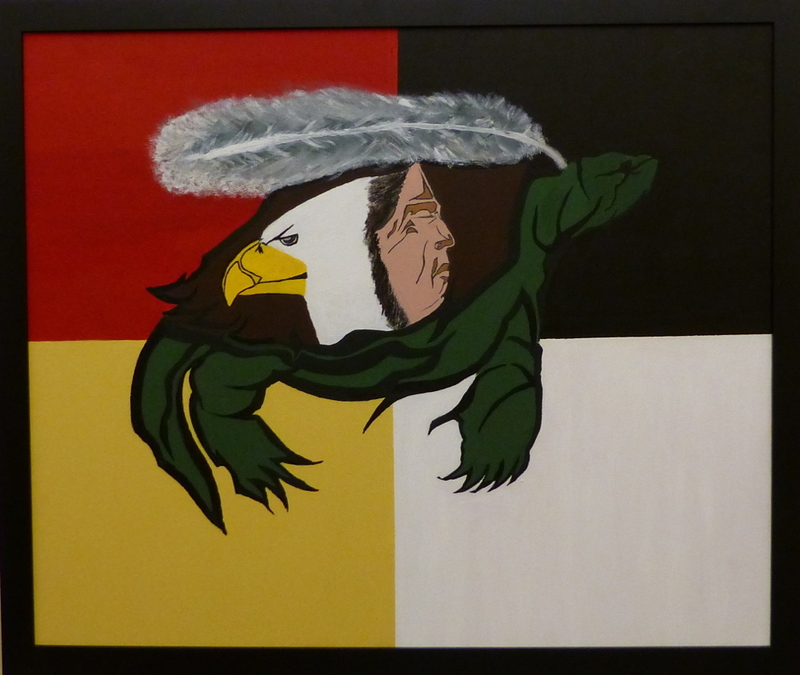 In this painting, it shows that the turtle is supporting an Elder, Eagle and feather. This signifies all the turtle carries, and that he understands the importance of what he brings on the journey. The turtle walks in a slow and gentle way on mother earth, because he knows the meaning of doing your best to learn from what the Creator offers up to us, and to apply it throughout our own journey. My name is Charlie Qrunnut, and I live in Igloolik Nunavut and am 24 years old. I am adopted by my parents, and we lived in a small island of 2,000 people. I was raised traditionally in an outpost camp in the summer time, and I would leave to go to school away from home through winter and spring. I lived my whole life going hunting almost every time there was good weather. My first language is Inuktitut, and I am a single father back home. I am also a firefighter back home, and I like to help people. My main hobby is drawing and art, and so this project has meant a lot to me to participate with such an impressive university such as Queen’s.